Here are some of the definitions I found. 1. extensive mention in the news media or by word of mouth or other means of communication. 4. information, articles, or advertisements issued to secure public notice or attention. Interesting Huh? Many actors believe that “Publicity” is only for the rich and famous. But some of the definitions provided might suggest that “Publicity” is a journey… Not a destination. The “business of securing public notice” is indeed a process. Yes, there was mention of “news media” but a much simpler phrase “word of mouth” was also included. And an actor does not need to be rich nor famous to have others speak well of them. There are many sides to the publicity puzzle. Even people who are not in the industry know that actors have to get a headshot and a resume. The headshot may be your calling card but marketing also includes a lot more. Postcards, Business cards, Thank you cards, Gifts, Letters, Flyers, Odd-Sized Marketing, and any number of creative creations that actors come up with. Work on materials that you feel good about handing over at an audition or sending in the mail. Actor Websites, Demo Reels, Submission Services, Online Magazines, Webseries, Press Releases, IMDb, Facebook, Twitter, Pinterest, Google+, LinkedIn, Instagram, Blogs, Kickstarter, Hootsuite, Google, Klout, Online Newsletters, Youtube, It goes on and on. Learn a little everyday. Every actor should now be on IMDb. It has become one of the primary places that industry professionals go to research actors. Even if you do not have credits yet, you can now at least post your headshot and resume so Casting Directors and Industry can find you. If they cannot find you on IMDb, then they know you do not have film and tv credits anyways. So at least let them see your headshot and have a way to reach you. IMDb is often a touchy subject for many actors because they cannot get credits up, or their name was spelled wrong, or they were listed as an “uncredited”, or their starmeter is dismal, etc… But this is a site that has become a staple in Hollywood and beyond so it is worth putting in a little effort into getting yours to look as professional as possible … no matter what level you are at in your career. In our relatively new world of viral marketing, The demo reel has become more important each year. There was a time that agents would use the no reel thing as an excuse to end a meeting with a green actor they had no intention of signing. But the demo reel has evolved into a very necessary tool. A reel does not need to have fancy footage with oscar winning costars to be useful. But it is important for every actor to have at least one clip of their work that looks decent and sounds good that shows that you can act. Sometimes all a casting director needs to know is what you really look and sound like because they have not met you in person. Or they might need to know that they will not regret giving you one of their twelve audition time slots because they are in a hurry and the producers will be at that session. If you do not have one great reel or at least a clip that serves you well in your career, then it is time to go out and get it. Produce your own if you need to. When people hear the words “Red Carpets” it often conjures up visions of glitz and glamour or perhaps George Clooney or Angelina Jolie at the Oscars. Because of this, many newer actors believe that they are not ready to get on red carpets or they simply won’t be invited. It is true that there are major events like the Oscars, and Emmys, that are more challenging to tackle, but there are also hundreds of other events every month in Hollywood. Film Festivals, Award Ceremonies, Book Signings, Grand Openings, Parties, Charity Events, Screenings, … You name it! I often joke that LA will throw down a red carpet for the opening of a letter! So it behooves us as actors to learn about this specialized part of our business. Friends & Family, Agents, Manager, Publicist, Mentors, Lawyer, Fans, Teachers, Coaches, Stylist,Your Fellow Actors, Cast & Crew, and so on… The people you surround yourself with contribute a great deal to your success, your growth, and simply your well-being. Make sure that they are a source of mental and emotional support for you. This is also where “word of mouth” comes into play. Until your projects get the kind of press that reaches millions of strangers, it is your inner circles and your community that will provide your best publicity! 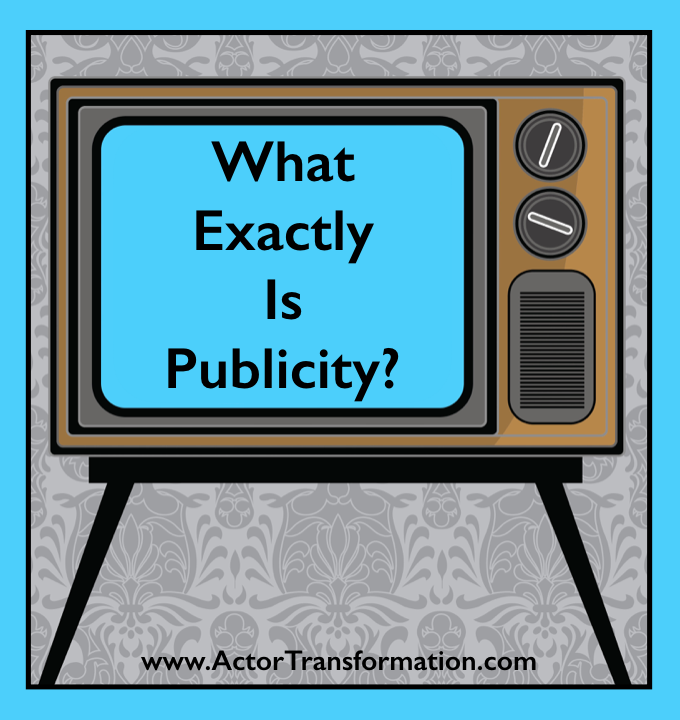 If you want to learn more about how to leverage publicity in your career and to create a MAJOR BREAKTHROUGH , join Kari and Actor Transformation!